Stock status is current as of 4/18/2019 9:27 AMET. 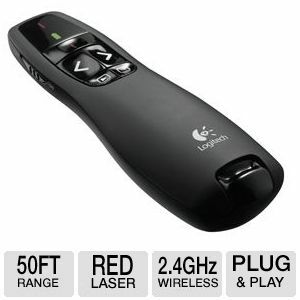 Wireless presenter R400 is designed to help you make your point. Its intuitive slideshow controls help you navigate through your presentation with confidence. Buttons are easy to find by touch. And its shape feels great in your hand. It�s got a red laser pointer that�s easy to see against most backgrounds and a range of up to 50 feet, so you�ve got the freedom to move around the room and mingle with your audience. A storable plug-and-play wireless receiver makes it simple to get started�there�s no software to install. And when you�re through, the receiver stores inside the presenter to make packing up easy.